Denmark's workhouse system had remarkable similarities to that which operated in the United Kingdom and Ireland and, perhaps surprisingly, continued until as recently as 1974. 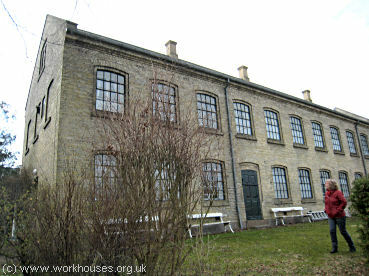 The workhouse at Svendborg was established in 1872 on Grubbe Møllevej, one of 450 such institutions in the country. The building was constructed as four sides of a square around an internal courtyard. 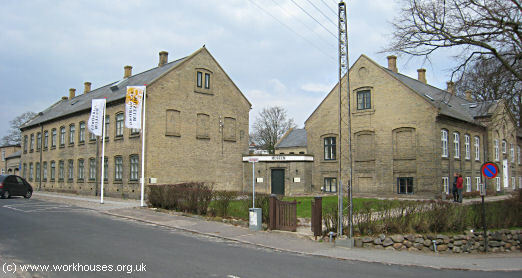 Svendborg Workhouse from the south-east, Denmark, 2010. The administrative block and main entrance lay along the east of the site. 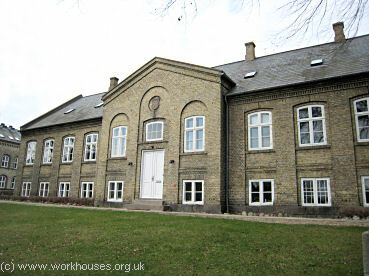 Administration block, Svendborg Workhouse, Denmark, 2010. At the north stood a block accommodating the 'undeserving' poor — the able-bodied, alcoholics, maintenance defaulters etc. Male and female inmates were strictly separated. There was also a special door which was used by those being given emergency relief at the workhouse during the 1920s economic crisis so that they would not need to mix with the undeserving paupers. North block ('undeserving' poor), Svendborg Workhouse, Denmark, 2010. 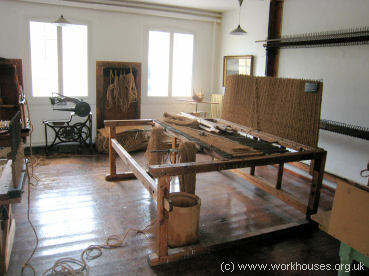 The north block contained various workshops including one for mat-making. Other tasks given to inmates included stone-breaking and wood-chopping. Mat-making workshop, Svendborg Workhouse, Denmark, 2010. The south block housed the 'deserving' poor — the elderly, chronic sick etc. South block ('deserving' poor), Svendborg Workhouse, Denmark, 2010. 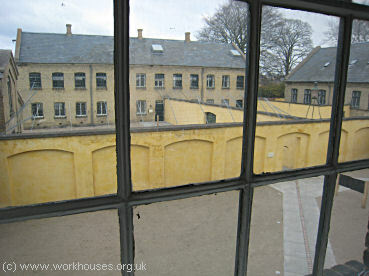 South block (left) and yard, Svendborg Workhouse, Denmark, 2010. 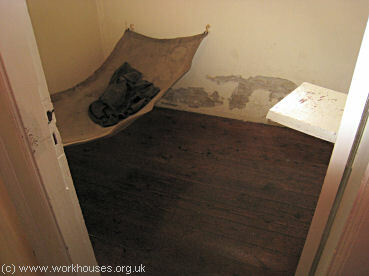 The various categories of inmate were kept separate and the different sections of the workhouse were separated by high walls which are still preserved today. 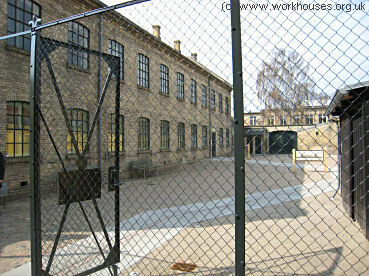 North block and inmates' yards from south block, Svendborg Workhouse, Denmark, 2010. New arrivals at the workhouse were given a bath and workhouse uniform. They passed their own clothes through a small hatch where they were fumigated and then stored. 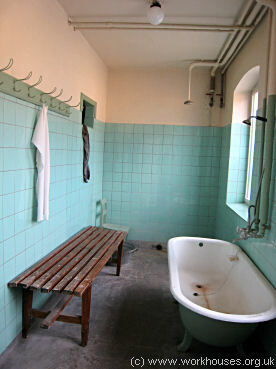 Bathroom and hatch (left) for inmates' clothes, Svendborg Workhouse, Denmark, 2010. Furniture in the inmates' dayroom included chairs with special backrests used to assist the process of being shaved. The workhouse rules and dietary are displayed on the wall. 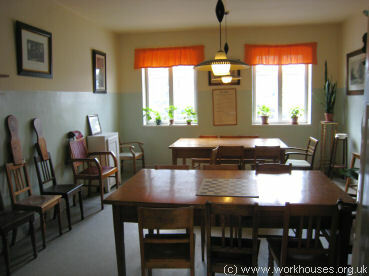 Inmates' dayroom in south block, Svendborg Workhouse, Denmark, 2010. Those breaking the extensive workhouse rules could spend some time in the refractory cell. Refractory cell, Svendborg Workhouse, Denmark, 2010. 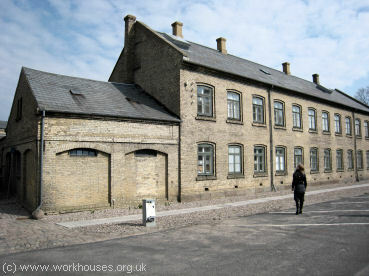 Svendborg's former workhouse is now a major museum, documenting Denmark's welfare system. The beautifully preserved building was refurbished in 2009 with a special emphasis on making the whole building accessible to disabled visitors. The museum houses an extensive collection of workhouse artifacts such as furniture, kitchen equipment, and inmates' clothing - original items from Svendborg itself have been supplemented by others collected together from other former institutions across the country. There is also a permanent exhibition on Denmark's children's homes and orphanages. A project at the museum is assisting former residents of the homes to obtain information about their past and to make contact with one another. 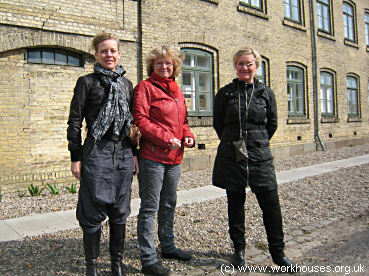 Curator Maria Rytter (centre) and her colleagues Inge Mønster-Kjær (left) and Sarah Smed Vestergaard (right). The enormous kindness and hospitality of Maria Rytter and her colleagues is gratefully acknowledged.